Our Melbourne Showroom is now open for appointments on Thursday, Friday and Saturdays at Level 1, 79 Parkhurst Drive, Knoxfield, VIC 3180. Here you will find many bedhead designs as well as upholstered bed bases, shoe boxes, footstools, side tables, valances and velvet cushions. We also have on display a vast library of fabric samples for you to touch and feel. Our name is synonymous with quality, custom made, bespoke detailing, exquisite fabrics and personal service. We encourage clients to visit our showroom to inspect designs and to feel the fabrics first-hand. 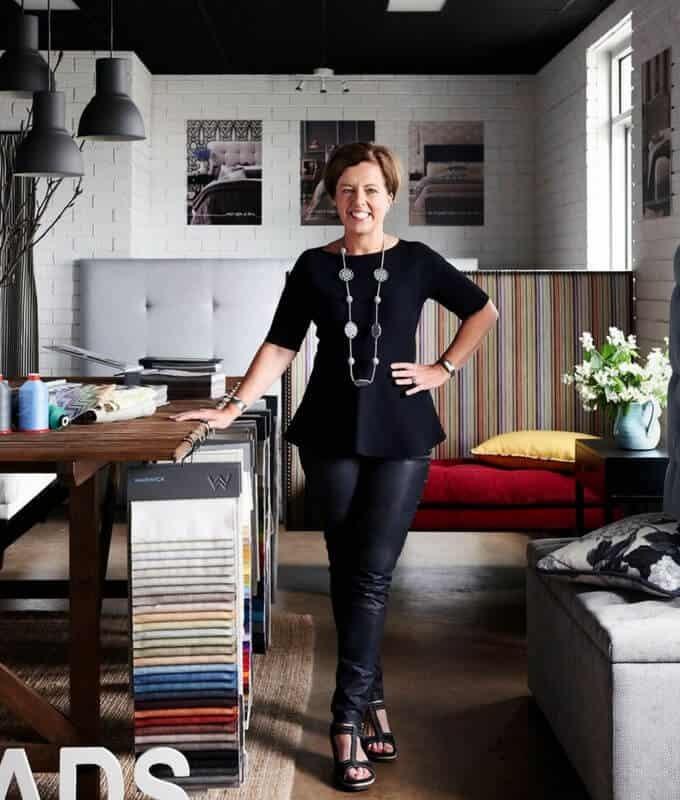 We provide an inspiring one hour, one-on-one consultation and encourage you to bring an iPad with images of your / your client’s bedroom, paint and/or carpet chip to help us with fabric selection. We promise you will be so inspired by your visit! Be inspired by our collaborations with our team of Melbourne Brand Ambassadors and their styling of our products! These stylists know that great design begins with proper planning. All have visited our Melbourne Showroom to see the bedheads, feel the fabrics and enjoy the Heatherly experience! Warm, kind and classy, Chyka Keebaugh is a successful businesswoman, events & styling powerhouse and Editor-In-Chief of her own online magazine Chyka.com. Chyka visited us at our Melbourne Showroom and selected two designs for her holiday home on the Mornington Peninsula: Our Hampton wingback design was chosen for the children’s rooms and for the main bedroom we “tweaked” our Empire for a minimal contemporary look. “Working with Heatherly Design has honestly been the most beautiful experience and I will be recommending you to everybody because it was that easy. You can buy a lot of bedheads out there, but to get something that’s made specifically for your room and your dimensions is perfect.” Chyka. Watch the video of Chyka’s Heatherly bedheads installed in her home! Shop The Hampton and Shop The Empire. Rebecca Judd is one of Australia’s busiest and best known personalities, working as a television presenter and brand ambassador for some of the country’s biggest companies. She is also a Speech Pathologist, wife and new mum to Billie and Oscar. We were humbled when the gorgeous Bec approached us back in 2013 for a Heatherly bed for her new bayside home in Melbourne. She was sold on the Richmond bed that she saw on The Block and was keen to replicate the look in a Belgian linen in her own home. We went onto to design our Fenwick bed for her son with pops of colour in the cross stitch. A recent makeover in her master bedroom has seen the existing Richmond bed move to the beach house and our best selling Rupert bed in felt take pride of place. Shop The Rupert, (top left and right) shop The Richmond (bottom left) and shop The Fenwick (bottom right.) Read the profile of Heatherly Design on Rebecca Judd Loves.